This is the syllabus I was never given in my university course. After meditating on my own slow and sporadic epiphanies on the subject of writing, I created this giant list of skills and criteria to get a better sense of where I am as a writer, and what I can try to teach my students. Obviously, this curriculum can’t guarantee that you will become a successful writer. These are just some guidelines that you might consider following if you feel as if you’ve been blundering around aimlessly for a while and not progressing in your craft, or even if you’re not sure whether you want to make writing your career. In case you do, this is the framework I will be referencing when I develop courses and ebooks for The Lady Writers League. PREPARATION is anything that precedes writing, whether it relates to your warm-up routine, your reading and influences, or your worldbuilding notes, plot outlines, etc. WRITING is anything that takes place while you’re writing, whether it relates to the actual time you spend putting words on a page, or the months or years of writing and erasing that go into creating a manuscript. FINISHING is anything that takes places after you’ve finished writing, whether it relates to the revision, the subsequent drafts, the conversations with early readers or editors, or the formatting, packaging and promotion of a finished piece of work. In medieval guilds, the “masterpiece” was the piece of work that a journeyman submitted to the guild for acceptance as a master. This piece would showcase all the techniques they had learnt throughout their studies and travels, and would represent the best work they were (and possibly ever would be) capable of producing. If the journeyman was accepted into the guild as a master, the guild would keep the masterpiece. In this sense, it doesn’t matter which level you feel you fall into. What differentiates the levels is your focus and purpose for writing. I want to distance the rubric as much as possible from a subjective consideration of “good” and “bad” writing. Quality must follow quantity, in my experience, and developing “good” taste is not nearly as difficult as demonstrating it in your writing. Another criteria I’ve used to determine the levels is “earning a living”. In spite of the age-old conflict between art and business, I think (especially in this internet era), the craftsman must be someone who can meet their physical as well as their intellectual and spiritual needs through their work. Hopefully this will also help teachers (and writing “gurus”) in deciding what guidance to provide their students, but please remember that the levels are merely conveniences. No matter how neophytic your pupils seem, I recommend following the advice given me by my own writing guru: include something for all learner levels (and a little extra for yourself). Each row deals roughly with the same concept, but each cell should nevertheless be considered on its own. You can use the rectangles to the left of each cell to mark completion, partial completion or topics that need extra attention. Don’t hesitate to add items to the syllabus (I’ve left a blank row for each level for this purpose), but think long and hard about your reasons before you remove anything. Practice and contemplate in equal parts. To be clear, this isn’t a syllabus for a university course, not even a four-year one. The best a university course can do is guide students in moving from Neophyte to Apprentice, and then give them as much information (and I stress information over feedback) as possible for the work ahead of them. Be patient. Some of the individual items on the syllabus are deceptively short – in practice, they can take years to learn. I plan on extending and improving this syllabus; currently the bias is towards self-published fiction writing. Extra apologies to poets for the word count-based pass criteria. 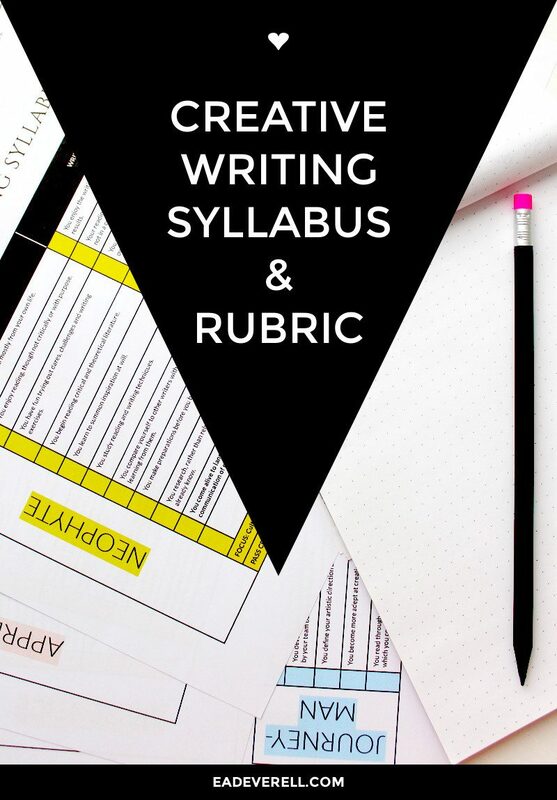 Use this syllabus for good! Feel proud of how far you’ve come, and inspired by the opportunities for learning that still lie before you. Compile a study list of subjects you feel you need to consciously improve. ▼ The exception might be the final row of the ‘Neophyte’ level – once you come alive to language, I fear you’re a lost cause. You will have to become a writer whether you like it or not.